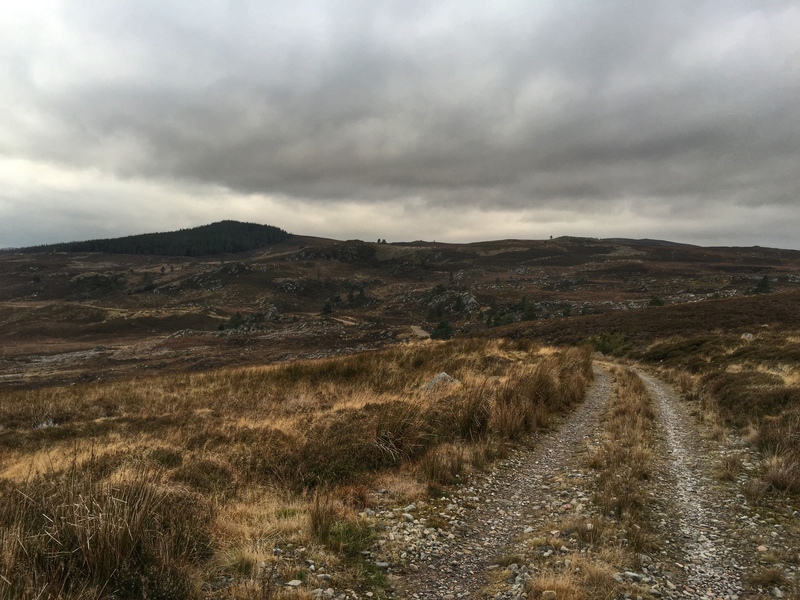 The day after our Galloway jaunt, the entire country was having a bath in a thunderous downpour. 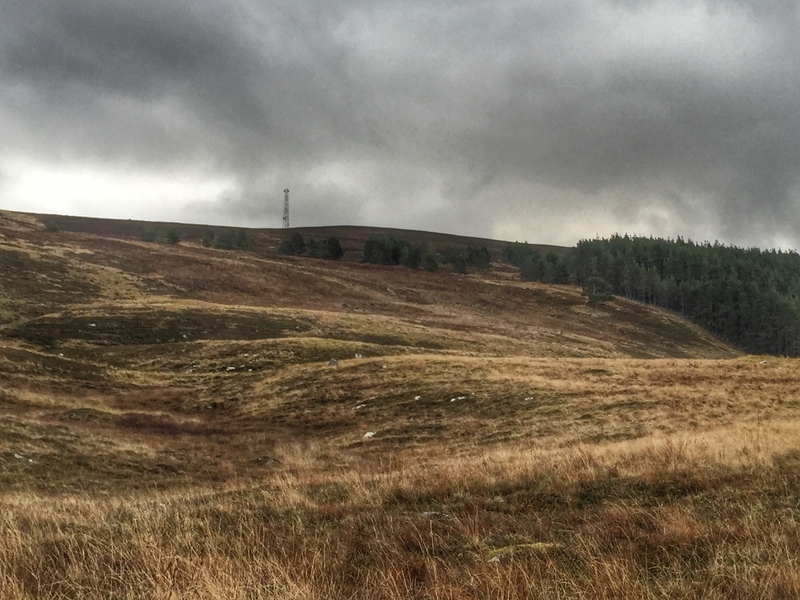 We had hoped to get out and visit some more Galloway hills but it wasn’t to be. 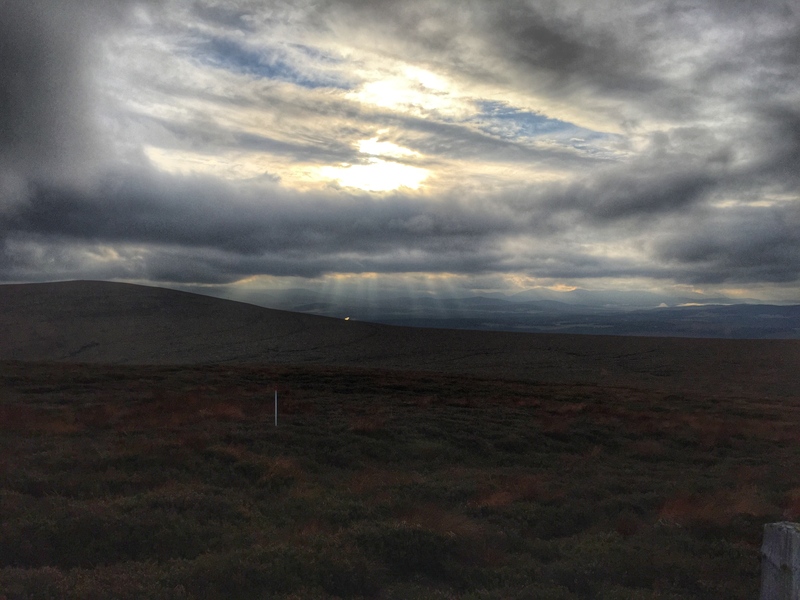 There was one tiny forecasted window of opportunity however, in the Pentlands. The Pentlands are another range I had never visited until this weekend, and to be honest, not a range I would have gone out my way to get to, being low-lying, far from home and in the built-up Central Belt. 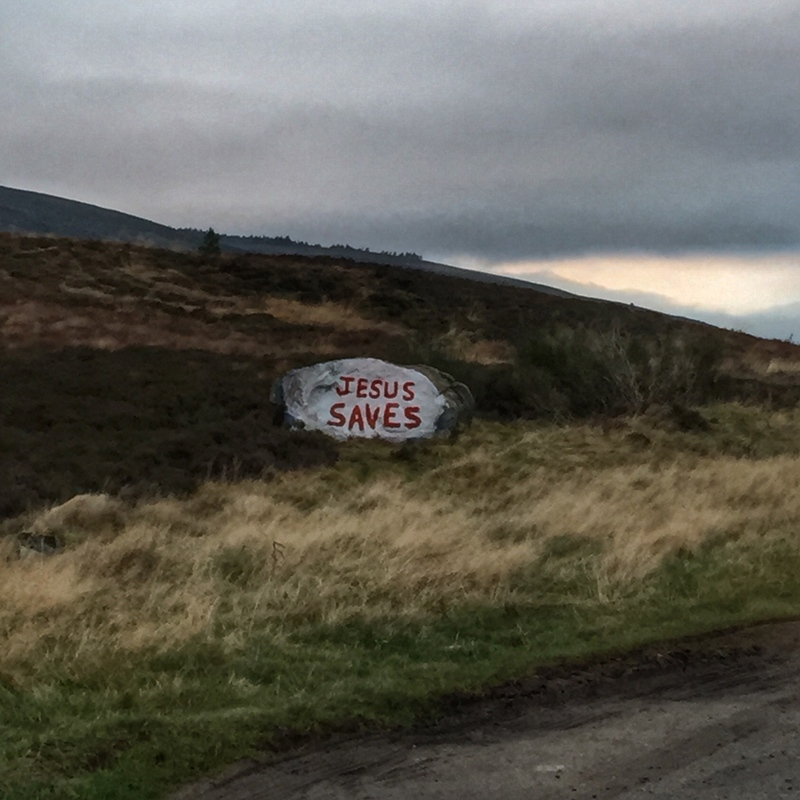 However it was a shame to waste so much money on petrol to get down this far south only to go home again so we decided to make a day of it, and duly drove up to near Penicuik the night before and camped in the van. 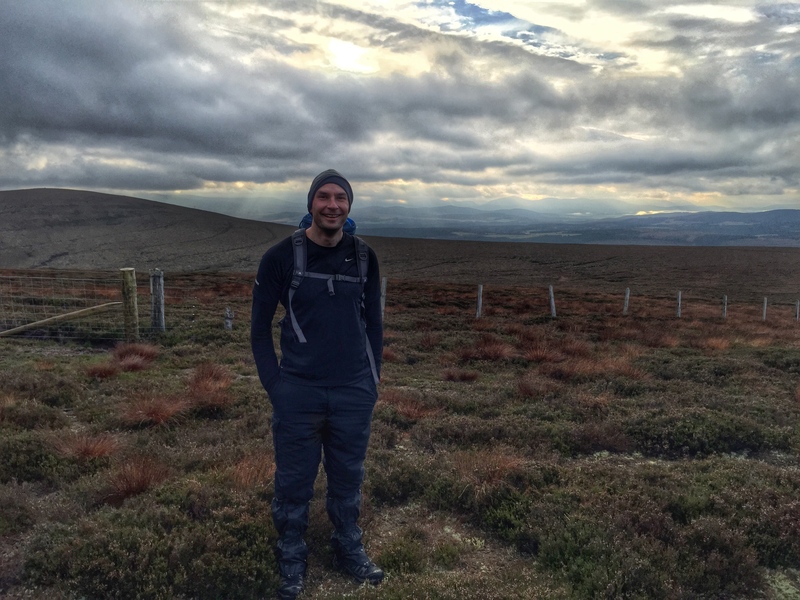 I was up visiting family in Forres last weekend and managed to persuade one of my brothers to come out with me for a walk on the beautiful Dava Moor. 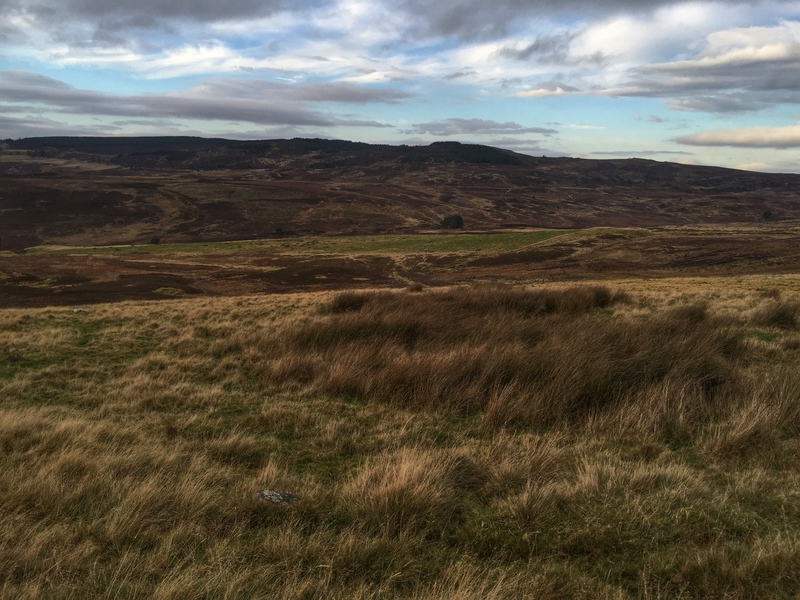 The Dava Moor is a vast and desolate stretch of moorland between the north from Forres and Nairn to the south at Grantown-on-Spey and Carrbridge. It truly is a real hidden gem. 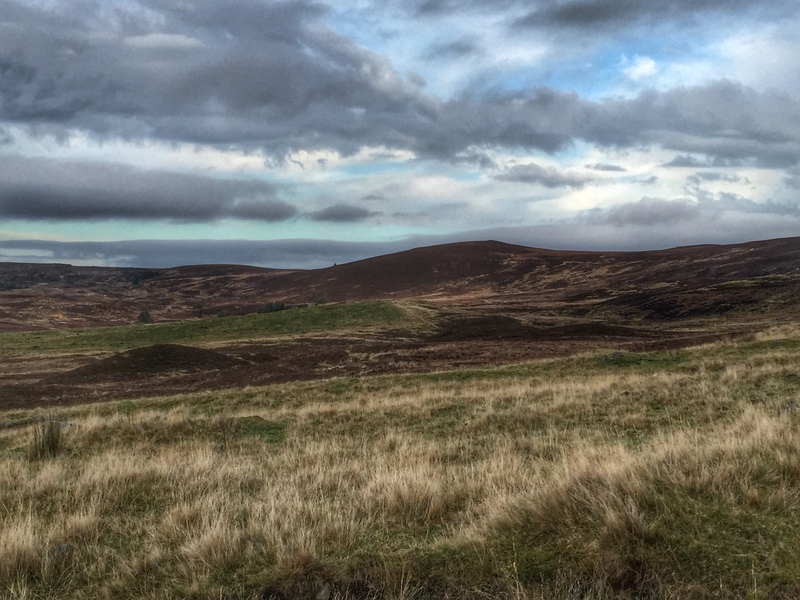 The road between Forres and Carrbridge is a spectacular landscape with a beauty all of its own, and makes a great cycle with big views on a quiet road. 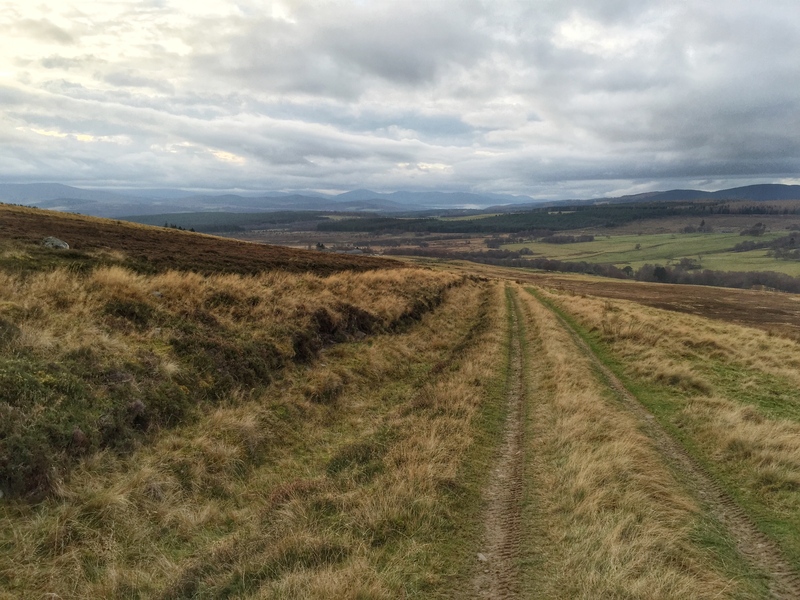 There is also the Dava Way, which is a long distance walk between Grantown and Forres on the old railway line. 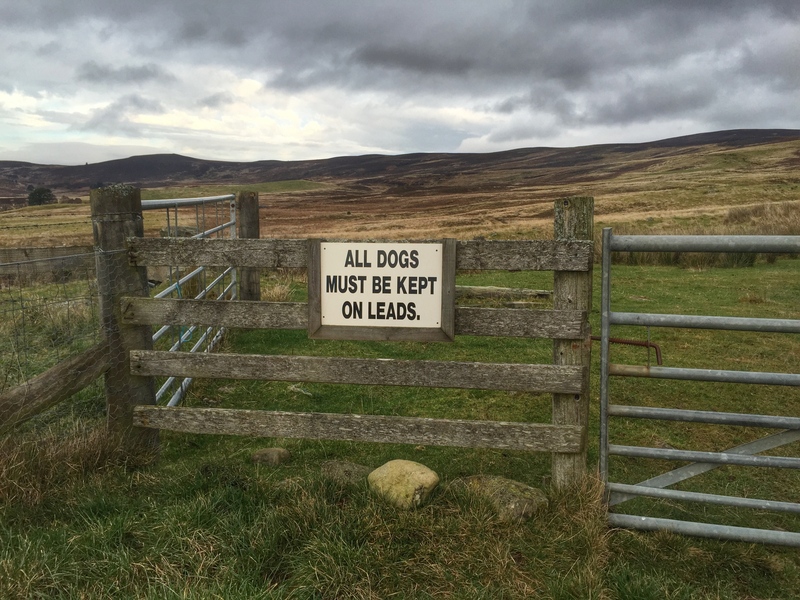 As railway paths go, this one is great – you are not blocked in by the railway embankments for most of it and cross the moor in a real feeling of solitude. 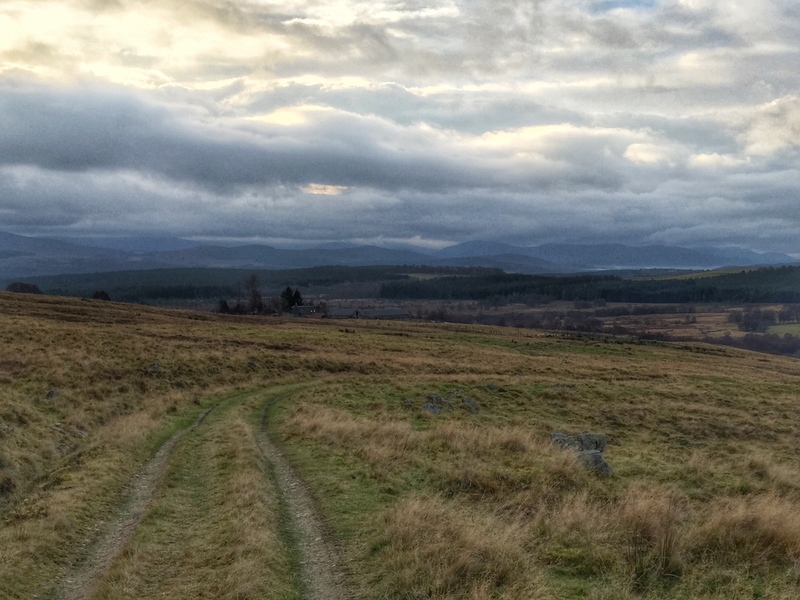 I biked it last year on my old trail bike which is also a good option, starting from Grantown. The Dava Way Association do a fantastic job in maintaining this way, an organisation I am happy donating to (find it here http://www.davaway.org.uk/). Back to the walk. 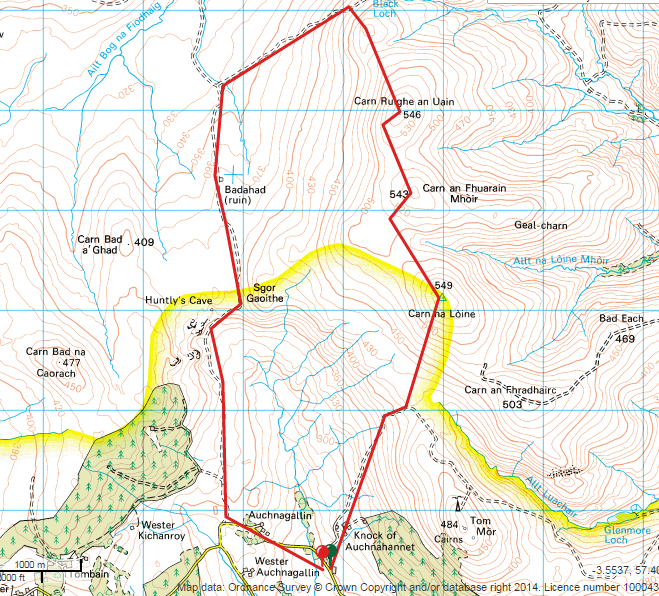 We chose the small hill, Carn na Loine (549m and a sub-2000 Marilyn) as a focus and made a circuit out of that. We drove down from Forres to Knock Of Auchnahannet and parked outside a house there, squeezing the car along the side of the road by the house bins (the Bongo is in the garage – a replacement radiator and an eye-watering pre-Christmas bill is to follow…she is worth it though). 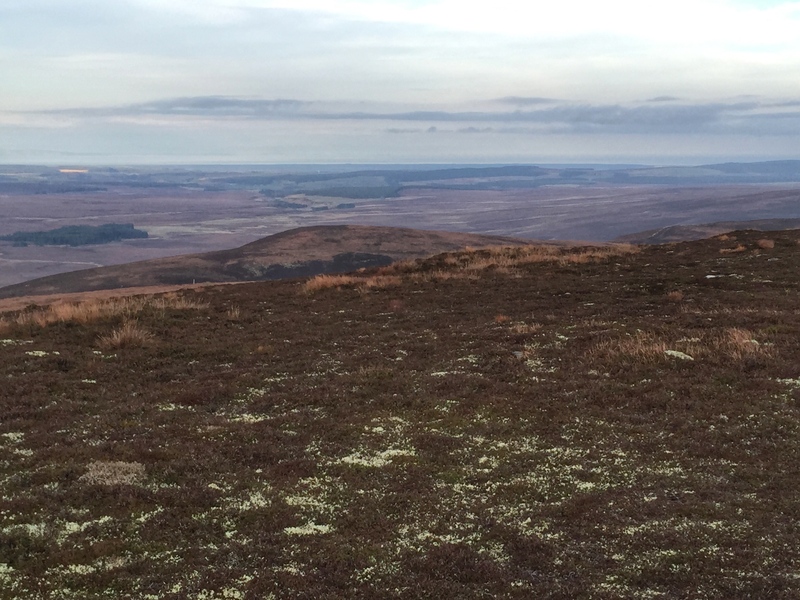 From here we took the good LR track north-east for about 1.5kms until it started to curve round towards the mast on top of Tom Mor. From there we left the track and carried straight on across the rough, tussocky heather, hard going at first but giving way to shorter, scrubbier terrain higher up, until we got to the summit trig point of Carn na Loine. 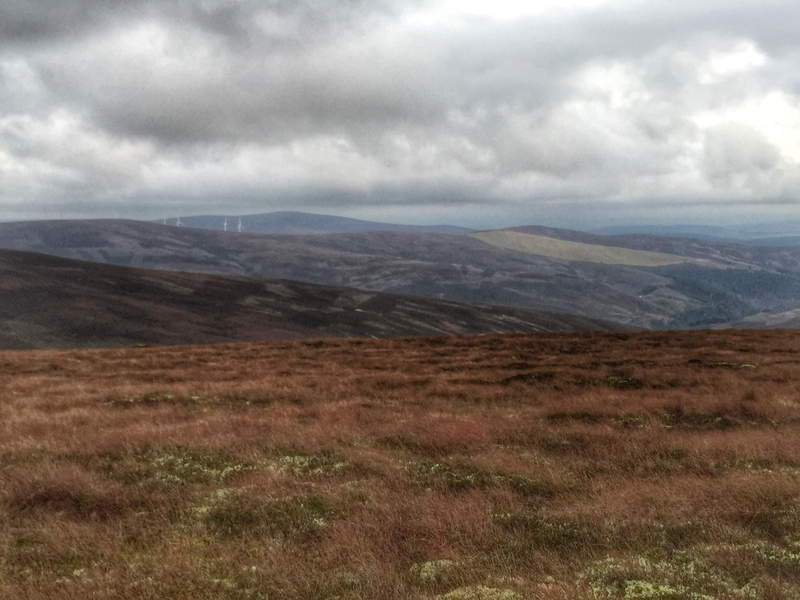 We got some pleasant views back towards Grantown and the Cairngorms / Monadhliath but it wasn’t as far ranging as we’d hoped due to the clouds. 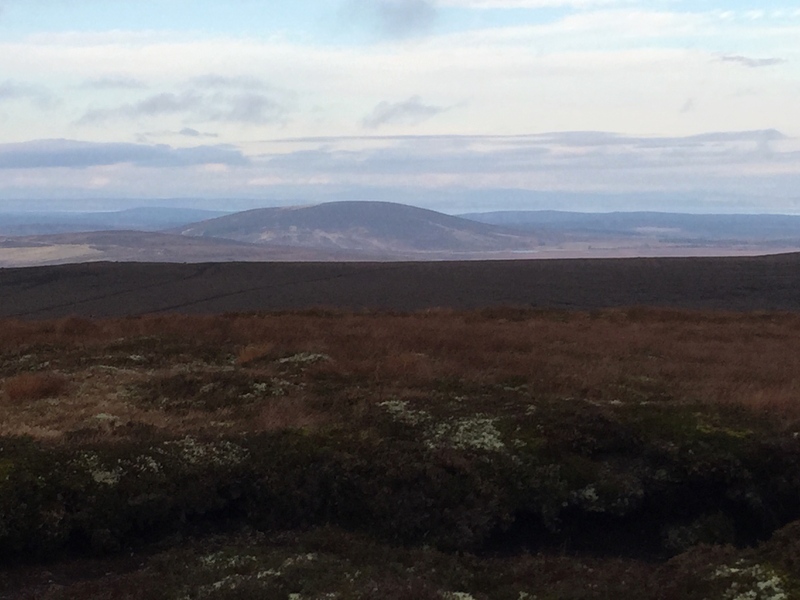 Sadly we could not see Ben Rinnes from the top – apparently a great view from here. 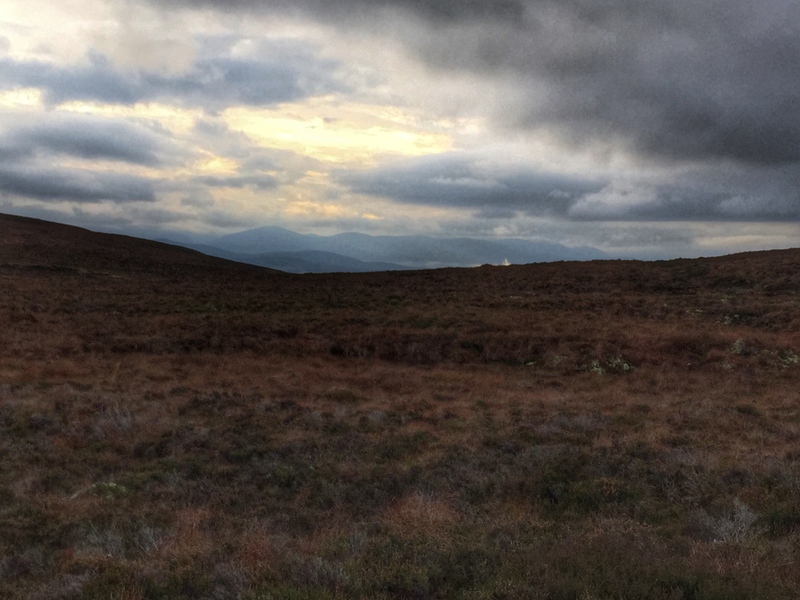 We could see the Knock of Braemoray to the north-west though – another interesting looking wee hill. We made our way across to the subsidiary top, Carn an Fhuarain Mhor, crossing a flat part that looked like it was once a loch. 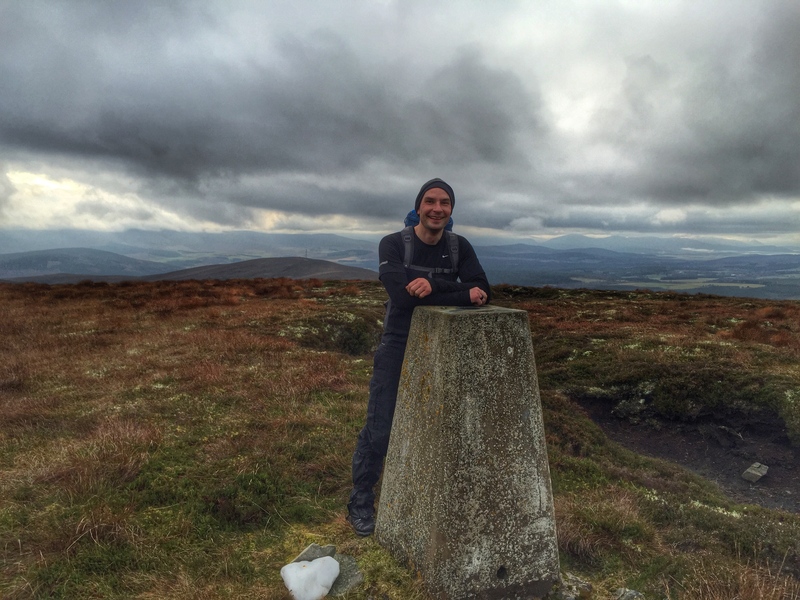 There was no summit marker here that we could see so we carried on across to Carn Ruighe an Uain where there was a small cairn, and we then clambered down through the deep heather to a good LR track. 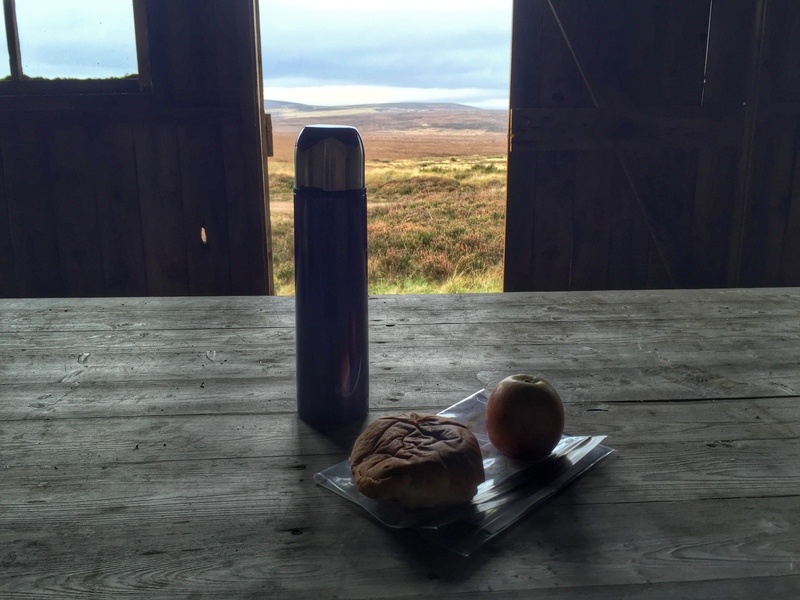 We saw a small building on the map where the track came to a t-junction and decided to have lunch there. 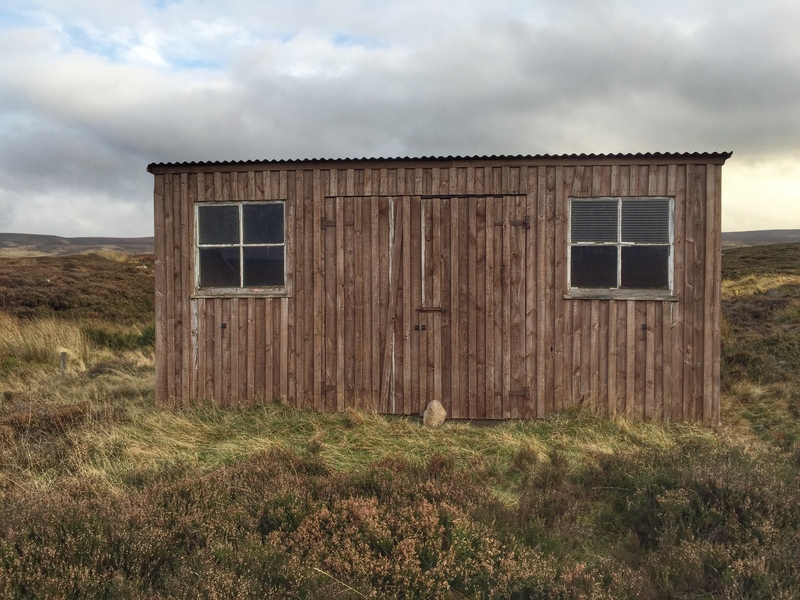 It turned out to be an unlocked hut with benches and a table – I guess a hut for grouse parties. It was a useful place to sit out of the cold and wind. After lunch we turned left to take the track south. 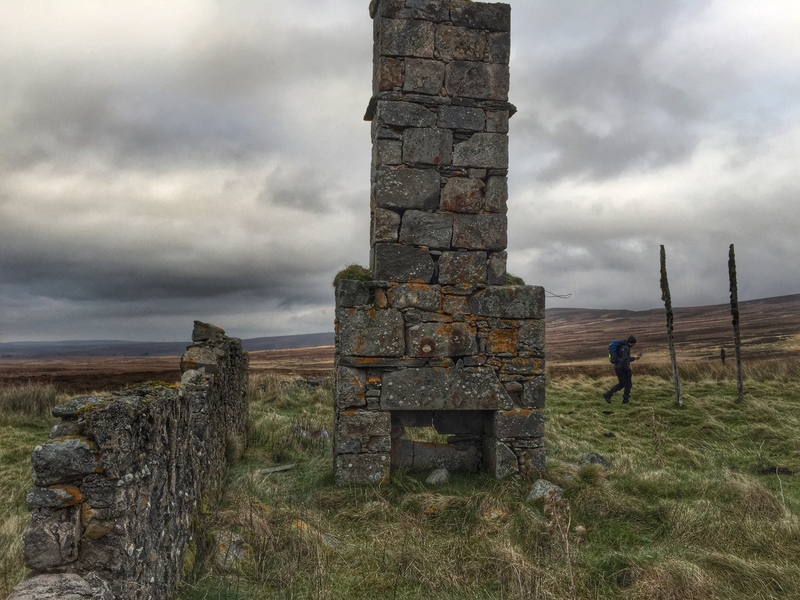 A further km along we passed the ruin of Badahad, now nothing left but a lum, much to Simon’s disappointment since he is quite a fan of old ruins. 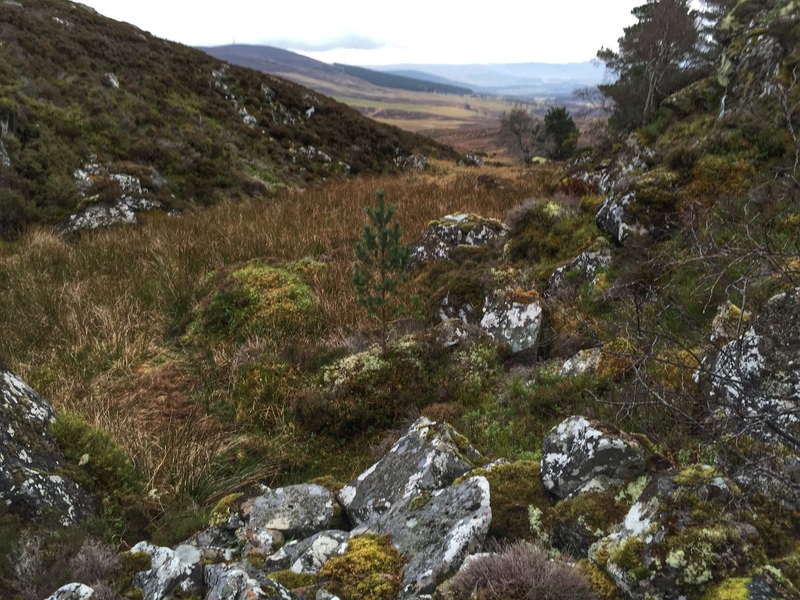 We were keen to find Huntly’s Cave marked on the map as well and we walked further along until we came to an interesting rocky section, strewn with big boulders. 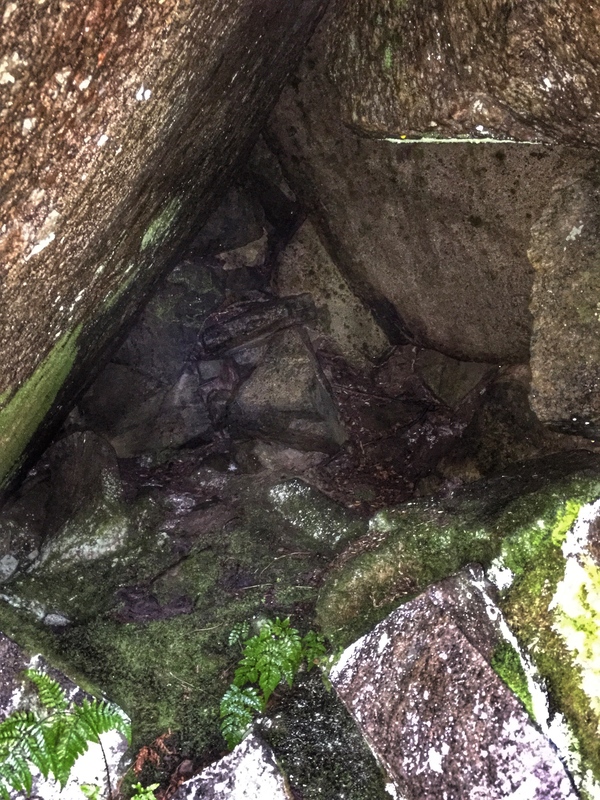 I spotted a faint flattened track leading off to the right and guessed it might lead to the cave. After a bit of clambering about and false alarms we eventually found it. It was about the size of a 2 person tent and distinctly creepy and uncomfortable looking inside. 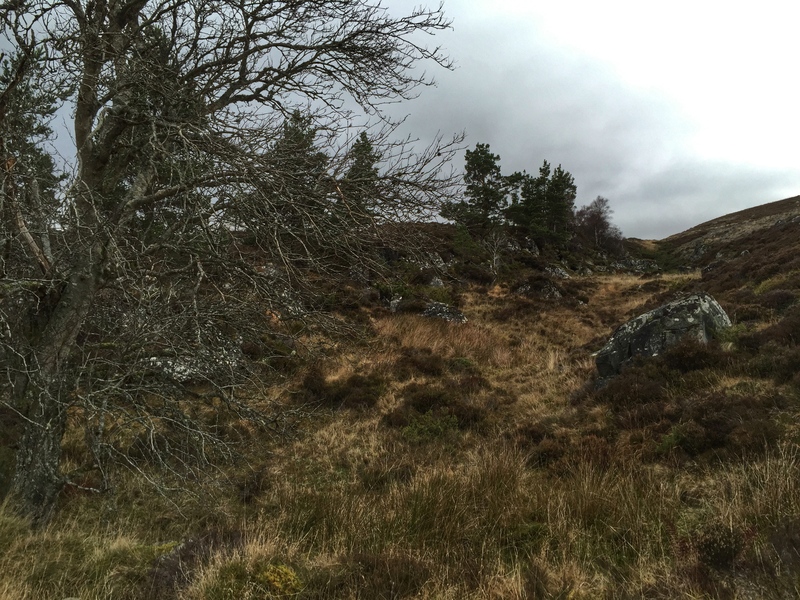 Looking this up online when I got back, this was apparently where a Royalist Lord Lewis Gordon, later the 2nd Marquis of Huntly hid in 1644 or 45 during the civil war when pursued by the Earl of Argyll. 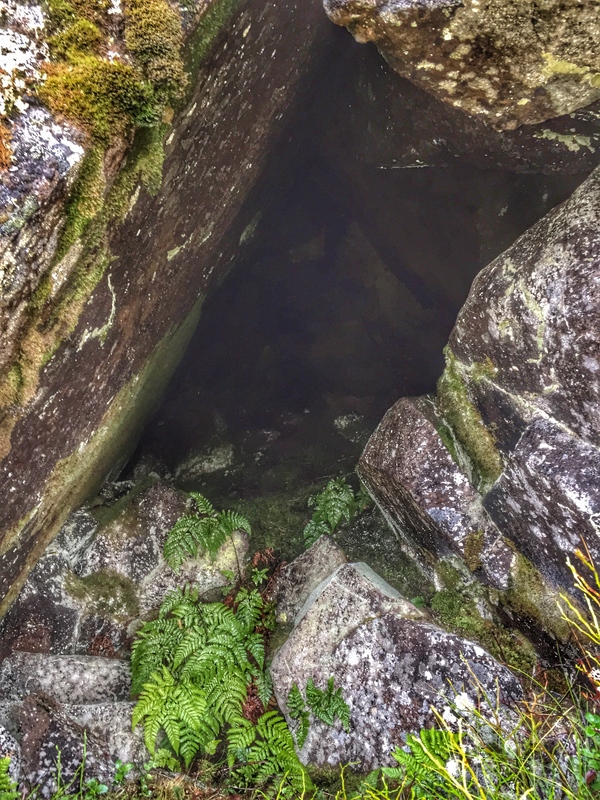 There are two Huntly’s Caves within 3km of each other (this one appears to be the lesser known one) so perhaps he bided in both. In no way would I ever want to hide out in that! 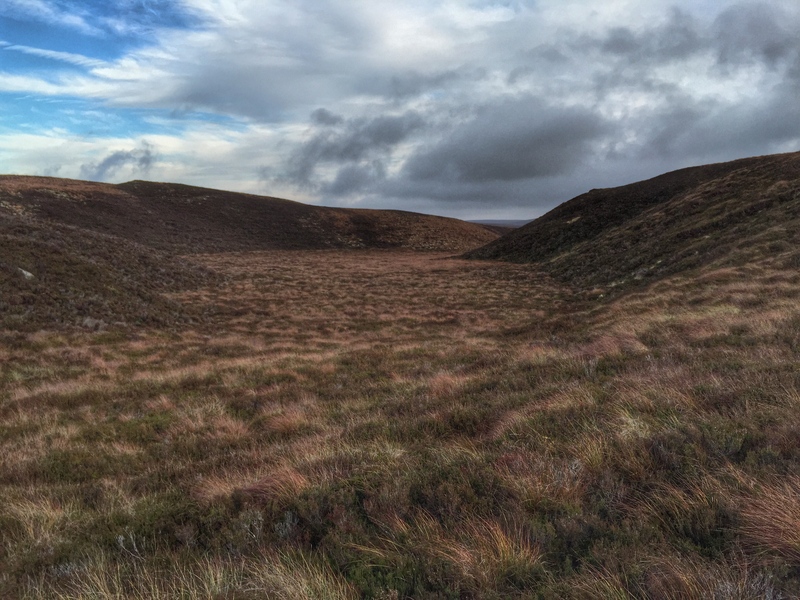 This was a nice walk for a shorter day and the bleakness of the moor makes it spectacular in any weather. I like the outdoors to keep fit in better than a gym or my cold garage. It’s good to get some daylight and fresh air. The longer nights and colder weather sure make it harder to get outside though. During the longer days of spring and summer I either get up early and run or go for a long evening bike ride depending when the forecast is looking its best, so when the days are short it really is a thought to push myself outside when the weather is looking horrible, especially when I can’t promise myself a treat when I return, just an afternoon of work. That small window of time leaves no room for faffing about.